LLILAS Benson Latin American Studies and Collections is proud to announce the inaugural exhibit of the Black Diaspora Archive. 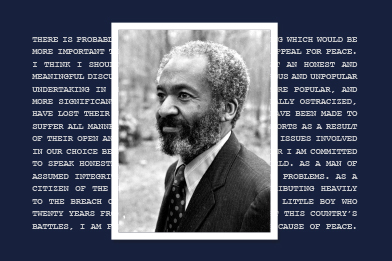 Life, Leadership, and Learning: From the Archive of Edmund W. Gordon, curated by Black Diaspora Archivist Rachel E. Winston, chronicles the life of New York–based psychologist, professor, author, and community leader Edmund W. Gordon (b. 1921). During a career spanning over 70 years, Gordon’s civic and intellectual contributions have championed racial equality and educational access for minority students. The archive includes, among other things, materials from Gordon's early days as an ordained Presbyterian minister, his years as a professor and clinician, his relationship with W.E.B. Du Bois and Charles White, and his activities in the civil rights movement. In 2014, The University of Texas System Board of Regents approved the renaming of the Black and Latino Studies Building as the Susan G. and Edmund W. Gordon & Charles W. and Frances B. White Building (Gordon-White Building) at The University of Texas at Austin. In 2015, the Benson Latin American Collection acquired Dr. Gordon’s papers as the first archival collection in the Black Diaspora Archive. The exhibition runs from Monday, September 17, 2018, through January 4, 2019, and is ree and open to the public during library hours.